Nice cover on this Virago Modern Classic edition. It reminds me of a vintage travel poster. I started reading Angela Thirkell's Barsetshire series last fall, when I was in dire need of a comfort read. 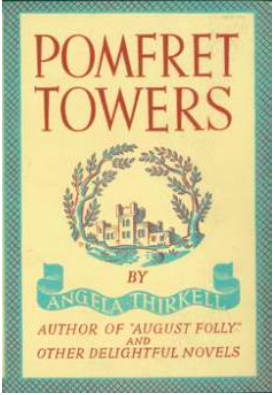 Beginning in 1933, Angela Mackail Thirkell (sister of Denis Mackail, who wrote the charming Greenery Street) wrote 29 novels set in the fictional county of Barsetshire, the same county as Trollope's novels. So far I've read five of the first six and have found all of them mostly delightful. If the words "English country house party in the 1930s" pique your interest as they do mine, then this is quite possibly the book for you. Pomfret Towers is #6 in the series and was published in 1938. The story begins with an invitation to a weekend house party. (I kept imagining it set in pre-war Highclere Castle AKA Downton Abbey, which I just visited in the UK; I'll post about it soon). The elderly Lord Pomfret is having a group for the weekend and is looking for some young people, so he invites Guy and Alice Barton, the young adult children of one of his tenants. Mr. Barton is a successful architect and his wife is a successful writer of historical novels. Guy works for his father and Alice, shy and delicate, is terrified of the idea of spending a weekend with a lot of smart and fashionable people. She warily accepts after Lord Pomfret tells her to bring along her friends Roddy and Sally Wicklow. Rowdy works for Lord Pomfret's agent, and Sally is a quintessential country girl who loves dogs and horses and is quite jolly. The house party gets under way and Alice is taken under the wing of the beautiful Phoebe Rivers, a sort of cousin to Lord Pomfret, who is visiting with her brother Julian, a rather spoiled artist-type, and their overbearing mother, Hermione, another novelist. Mrs. Rivers' primary purpose in the visit is to get Phoebe paired off with Lord Pomfret's heir apparent, Giles Foster. The house also party includes Mr. Johns, one of the partners of Mrs. Rivers' publishing firm, who is not convinced that the income from her books is worth the trouble of putting up with her. Most of the story is taken up with the possible pairings-off between the various young people and the chagrin of Mrs. Rivers when these silly youths don't follow her wishes. There are also some very funny bits about writers and publishers. Our omniscient narrator gives us some of Mr. Johns' more amusing thoughts, as well as Lady Pomfret's steadfast secretary Miss Merriman, in whom the unbearable Mrs. Rivers has met her match. I really enjoyed this book -- it was light and funny, if a bit predictable. It was pretty easy to guess who was going to end up with whom, though there were some amusing minor plot twists. 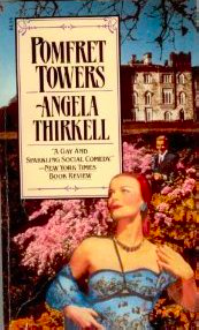 Also, in previous Thirkell books there have been occasional racist remarks which made me uncomfortable (though I do realize anti-Semitism was pretty common among the middle and upper classes during that period); this book, thankfully, didn't have any that I remember. And now for some alternate book covers! This cover is from the 1980s. Is that supposed to be Deborah Kerr? Whoever she is, she looks far too old and glamorous unless she's supposed to be Mrs. Rivers. And what is that bizarre cord wrapped around her shoulder and bosom? is she being lassoed by the guy hiding in the bushes? It's all very strange. I suppose this one is better, it's the Moyer-Bell edition from 2007. Their covers are generally good (though I have found some egregious typographical errors in the text). I don't know enough about fashion history to know if this dress is period-appropriate. I don't have this edition so I don't know the source of the cover image. The original cover. 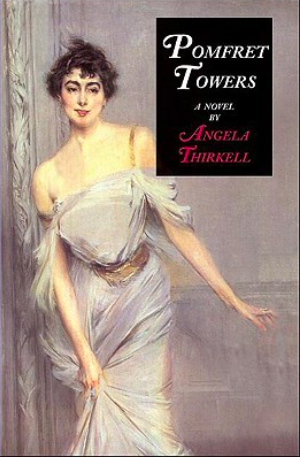 I do love how it explains Thirkell is the "author of 'August Folly' and other delightful novels.' Even her own publisher thinks her books are delightful, so it must be true! Anyway, of the five Thirkell novels I've read so far, this was definitely my favorite and I'm very much looking forward to the next 24 (!) books in the series. I already own about a dozen in Moyer-Bell editions that I picked up at Half-Price Books back in Texas, though there are a few volumes in the series which are difficult to find and can be pricey. After considering, I have decided to count this as my Classic by a Woman Author -- Thirkell wrote this book eighty years ago and it's still in print, so I'm calling that a classic. 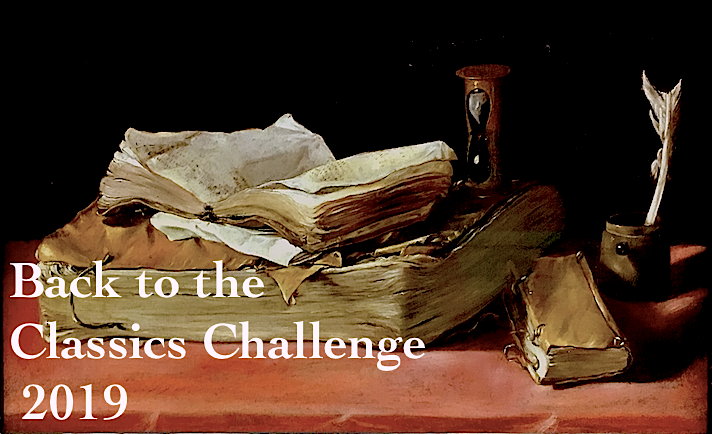 That makes ten books read for the Back to the Classics challenge, only two left to go! I think I also own Growing Up -- according to Goodreads it's #12 in the series. I don't think it really matters in what order you read them. They are just the thing for a light summer read. I love her books...and it's fun to see the covers. I like the new Virago covers but I think I like the "delightful" one best of all. I love the original cover too. I love the new Virago editions but oddly some of the series haven't been reprinted or are already out of print -- I've been trying to track down a VMC copy of #9, Cheerfulness Breaks In, and used copies are horribly expensive. No idea why. The Moyers Bell cover is Madame Charles Max, by Giovanni Boldini, 1896. So no ... not period-appropriate! I have this title, with a different cover, on my shelf waiting patiently for my attention. Yep, definitely not period appropriate! I always wonder why they would decide to put an image 50 years out of date on a book cover. . . do they think people don't notice? It's a nice cover, just the wrong period. I like the original cover even though I, sadly, own a copy with the 1980s cover. I am trying to slowly build my collection of Thirkell novels. I have read most of them but none of the libraries near me have them anymore. I wish libraries wouldn't get rid of older books. Pomfret Towers is one of my favorites. I own about half of them, mostly used copies acquired from the Half-Price Books chain while I was living in Texas. I've since started buying the VMC editions when possible. My current library has just a few of her books but I think I already own nearly all of them. It does make me sad when libraries weed out books -- usually if there are no check-outs in two years, a book will be withdrawn from the system. I guess the answer is to seek out those lesser-known books and check them out to save them! 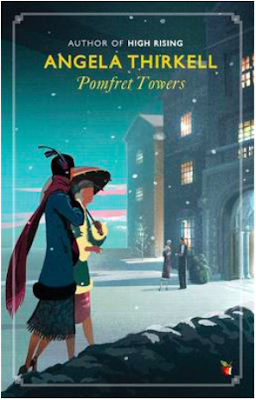 I adored Pomfret Towers and your description of it as a comfort read set in Downton Abbey is perfect. Glad you enjoyed it! I kept picturing all the characters as if they were in Downton Abbey, just a few years later. Seriously, why are there no adaptations of her novels? Or are there, but I've just never seen them? Thirkell could really be the Next Big Thing for PBS. Pomfret Towers is one of my very favorites! And mine is the really hideous 80s one, which is one of the worst of an entire series of bad covers. That cover is seriously awful. The red-haired woman looks nothing like I picture Alice -- unless she's supposed to be Phoebe, or Mrs. Rivers. It looks so dramatic and almost gothic, nothing like a light-hearted comedy. I've read all of her Barsetshire books but now I've gone back to the beginning so I can read them all in the correct order this time. The wartime books are my favourites. I just got The Brandons, really looking forward to starting it!